Edward James Martin Koppel (born February 8, 1940) is a British-born American broadcast journalist, best known as the anchor for Nightline , from the program's inception in 1980 until 2005. A news presenter – also known as a newsreader, newscaster, anchorman or anchorwoman, news anchor or simply an anchor – is a person who presents news during a news program on the television, on the radio or on the Internet. They may also be a working journalist, assisting in the collection of news material and may, in addition, provide commentary during the program. News presenters most often work from a television studio or radio studio, but may also present the news from remote locations in the field related to a particular major news event. Nightline is ABC News' late-night news program broadcast on ABC in the United States with a franchised formula to other networks and stations elsewhere in the world. 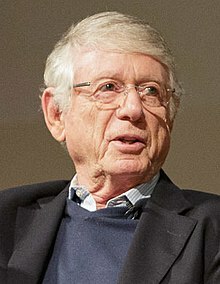 Created by Roone Arledge, the program featured Ted Koppel as its main anchor from March 1980 until his retirement in November 2005. Its current, rotating anchors are Dan Harris, Byron Pitts, and Juju Chang. Nightline airs weeknights from 12:37 to 1:07 a.m., Eastern Time, after Jimmy Kimmel Live!, which had served as the program's lead-out from 2003 to 2012. After leaving Nightline, Koppel worked as managing editor for the Discovery Channel, a news analyst for NPR and BBC World News America and a contributor to Rock Center with Brian Williams . Koppel is currently a special contributor to CBS News Sunday Morning . His career as foreign and diplomatic correspondent earned him numerous awards, including nine Overseas Press Club awards and twenty-five Emmy Awards. A managing editor (ME) is a senior member of a publication's management team. Typically, the managing editor reports directly to the editor in chief and oversees all aspects of the publication. Discovery Channel is an American pay television network and flagship channel owned by Discovery, Inc., a publicly traded company run by CEO David Zaslav. As of June 2012, Discovery Channel is the third most widely distributed subscription channel in the United States, behind TBS and The Weather Channel; it is available in 409 million households worldwide, through its U.S. flagship channel and its various owned or licensed television channels internationally. Nelson is a town and civil parish in the Borough of Pendle in Lancashire, England, with a population of 29,135 in 2011. It is 4 miles (6.4 km) north of Burnley on the Leeds and Liverpool Canal. Edward Roscoe Murrow, was an American broadcast journalist and war correspondent. 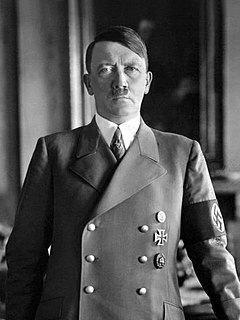 He first gained prominence during World War II with a series of live radio broadcasts from Europe for the news division of CBS. During the war he recruited and worked closely with a team of war correspondents who came to be known as the Murrow Boys. McBurney School was a college preparatory school in Manhattan run by the YMCA of Greater New York. Koppel as the diplomatic correspondent for ABC News, 1976. While hosting Nightline, Koppel also hosted a series of special programs called Viewpoint, beginning in 1981, which provided media criticism and analysis. It was envisioned by ABC News Vice President George Watson as a way to address any media bias that viewers might believe that they encountered on the network. Broadcast before a live audience, it provided viewers with a chance to question how stories were reported or critique television news. Viewpoint was broadcast sporadically, from 1981 until 1997. Koppel made occasional guest appearances on The Daily Show appearing in extreme close-up as a disembodied head, acting as Jon Stewart's journalistic conscience, sometimes as the replacement for the so-called "Giant Head of Brian Williams" projected on the screen behind Stewart. Koppel has jokingly insisted that "this is the actual size of [Koppel's] head"
On December 12, 2011, Koppel made his first appearance on NBC Nightly News with Brian Williams as a reporter. He would later become a special correspondent for NBC's Rock Center until the show's cancellation. Koppel speaks German and French, in addition to his native English. Koppel on Discovery: Iran, The most Dangerous Nation? John Charles Patrick Croghan Daly, generally known as John Charles Daly or simply John Daly, was an American radio and television personality, CBS News broadcast journalist, ABC News executive and TV anchor and a game show host, best known as the host and moderator of the CBS television panel show What's My Line? 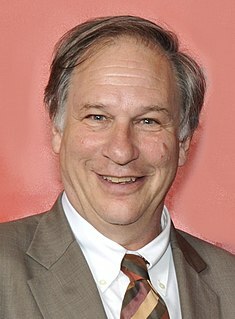 Robert Louis Krulwich is an American radio and television journalist who currently serves as a science correspondent for NPR and is a co-host of the program Radiolab. He has worked as a full-time employee of ABC, CBS, National Public Radio, and Pacifica. He has done assignment pieces for ABC's Nightline and World News Tonight, as well as PBS's Frontline, NOVA, and NOW with Bill Moyers. TV Guide called him "the most inventive network reporter in television", and New York Magazine wrote that he's "the man who simplifies without being simple". Christopher W. Wallace is an American television anchor and political commentator who is the host of the Fox Broadcasting Company/Fox News program Fox News Sunday. Wallace has won three Emmy Awards and the Dupont-Columbia Silver Baton Award. Wallace has been with Fox News since 2003. As a previous moderator of Meet the Press on NBC, Wallace is the only person to date to have served as host/moderator of more than one of the major American Sunday morning political talk shows. 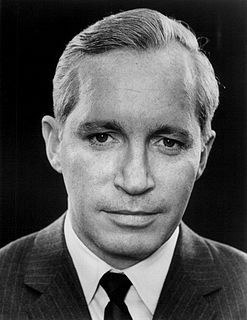 Frank James Reynolds was an American television journalist for CBS and ABC News. William Francis "Bill" Weir is an American television journalist, a correspondent and anchor for CNN and the creator and host of the global documentary series "The Wonder List with Bill Weir." He is the former co-anchor of Nightline on ABC television network in the United States an co-anchored the weekend edition of Good Morning America from 2004 to 2010. Christopher Robert "Chris" Bury is an American journalist at Al Jazeera America, where he is a correspondent for America Tonight. He is best known for being a correspondent at ABC News Nightline, where he also served as substitute anchor. Bury was also a national correspondent based in Chicago for World News with Diane Sawyer and Good Morning America. Michel McQueen Martin is an American journalist and correspondent for ABC News and National Public Radio. After ten years in print journalism, Martin has for the last 15 years become best known for her radio and television news broadcasting on national topics. Special Report with Bret Baier is an American television news and political commentary program, hosted by Bret Baier since 2009, that airs on Fox News Channel. It is broadcast live each Monday through Friday at 6:00 p.m. ET. The program focuses on both reporting and analysis of the day's events, with a primary focus on national American political news. The show has been a part of the Fox News program lineup since 1998 and is the number one cable news broadcast in its time slot. Linda Wertheimer is an American radio journalist for NPR. Mike Schneider is an American television news anchor and producer. He has held leading anchor and reporting positions at CBS, ABC, NBC, Fox, PBS and Bloomberg Television, most recently hosting and producing the adventure/history special, "On the Trail with Mike Schneider", which was broadcast in 2016 on the PBS flagship station Thirteen/WNET, WLIW(TV), and NJTV. The program generated positive news headlines across the United States and in the United Kingdom, as well. Cynthia McFadden is an American television journalist who is currently the senior legal and investigative correspondent for NBC News. She was an anchor and correspondent for ABC News who co-anchored Nightline, and occasionally appeared on ABC News special Primetime. She was with ABC News from 1994 to 2014 and joined NBC News in March 2014. Stephen Scott Bell was an American journalist and educator. He was news anchor of the ABC News programs Good Morning America and World News This Morning, and a professor emeritus of telecommunications at Ball State University. Leroy Sievers was a journalist who won 12 national news Emmy Awards, two Peabody Awards, and two Alfred I. duPont-Columbia University Awards. He was a commentator for National Public Radio, served as a bureau chief for CBS news, served as an executive producer for the ABC program Nightline, and covered a variety of global conflicts as a war correspondent. Sievers was also part of the Discovery Channel program entitled Living with Cancer, hosted by his friend Ted Koppel. This show was taped at the Discovery Channel Headquarters in Silver Spring, Maryland on May 6, 2007, and featured other cancer survivors, including Elizabeth Edwards and Lance Armstrong. Bonnie Strauss is an award-winning broadcast journalist and documentary filmmaker. The Edward R. Murrow Forum on Issues in Journalism is an annual event held at Tufts University. It is sponsored by the Film and Media Studies Program (FMS) at Tufts University, the Edward R. Murrow Center for the Advancement of Public Diplomacy, and the Jonathan M. Tisch College of Citizenship and Public Service. Dedicated to illuminating aspects of the many contributions Edward R. Murrow made to journalism and public diplomacy, the Forum brings together interdisciplinary panels to reflect on Murrow’s legacy and relate it to contemporary issues in journalism. 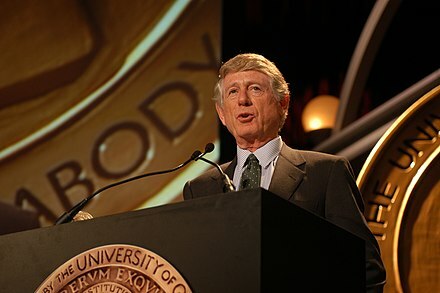 The Forum debuted in 2006 with former Nightline host Ted Koppel serving as the keynote speaker and moderator examining the contemporary state of the news business. In 2007 retired CBS News anchor Dan Rather led a panel discussing the coverage of war and conflicts. In 2008 former NBC Nightly News anchor Tom Brokaw and panelists explored the current state of political coverage. 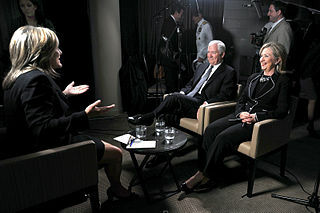 The 2009 panel was headlined by MSNBC’s Hardball host Chris Matthews, along with former Massachusetts Governor and 1988 Democratic presidential candidate Michael S. Dukakis, and Janet Wu, WCVB-TV’s political reporter discussing the press’ role in encouraging or discouraging people from seeking public office. In 2010 panelists Casey Murrow, author Lynne Olson, and producer/Massachusetts ACLU Vice President Arnie Reisman discussed Murrow and his efforts to bring down Senator Joseph McCarthy after the blacklist and the contemporary state of blacklisting, self-censorship, and political redlines for the media. In 2011 panelists Katie Couric and Jonathan Tisch discussed Couric's career as well as the state of journalism in a social media and technology-driven world. In 2012 panelists Brian Williams and Jonathan Tisch discussed Williams's career and tactics, opportunities, and challenges of covering campaigns in 2012. The 2013 forum featured Christiane Amanpour discussing the evolving role of foreign correspondents, while Huffington Post founder Arianna Huffington examined the changing face of journalism in the digital age for the 2014 forum. In 2015, ABC News' Chief Anchor George Stephanopoulos discussed reliability in the 24-hour news cycle. Greg Dobbs was an ABC News television correspondent. Over two-and-a-half decades, appearing on World News, Nightline, 20/20, and Good Morning America, Dobbs won two national Emmys and was nominated for more. He also won the Distinguished Service Award from the Society of Professional Journalists. The 34th News & Documentary Emmy Awards were held on October 1, 2013, at Rose Hall, Home of Jazz at Lincoln Center, located in the Time Warner Center in New York City. Awards were presented in 42 categories, including Breaking News, Investigative Reporting, Outstanding Interview, and Best Documentary. In attendance were over 900 television and news media industry executives, news and documentary producers and journalists. ↑ Vanity Fair. Books.google.com. Retrieved 2017-01-18. 1 2 3 4 5 6 7 8 9 10 11 12 13 14 15 16 John Ehrlichman. "Why We Stay Up for Ted Koppel." Parade Magazine , September 27, 1987, pp. P18, 20-21. ↑ "Ted Koppel Biography (1940–)". Filmreference.com. Retrieved 2010-07-18. ↑ Dan Nimmo and chevelle Newsome. Political Commentators in the United States in the 20th Century. Greenwood Press, 1997, p. 151. ↑ "Ted Koppel". ABC News. November 17, 2005. Retrieved January 2, 2011. ↑ "Assignment: China - The Week that Changed the World | US-China Institute". China.usc.edu. Retrieved 2017-01-18. ↑ "The Ted Koppel Collection." 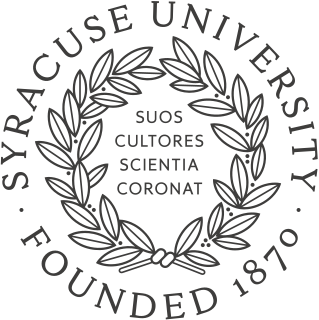 Syracuse University Library, Special Collections. ↑ "Ask the Globe." Boston Globe, April 28, 1988, p. 52. ↑ Mark Jurkowitz. "Koppel to Leave Nightline and ABC News." Boston Globe, April 1, 2005, p. D5. ↑ Judy Flander. "Ted Koppel to Moderate 'Viewpoint.'" Chicago Tribune, August 12, 1982, Section 4, p. 11. ↑ Jerold Wedge (16 September 2015). "(Tuesdays with) Morrie Schwartz: Lessons on Living, Ted Koppel Nightline Interview" – via YouTube. ↑ Consoli, John. "Ted Koppel Joins BBC World News America". Adweek.com. Retrieved 2017-01-18. ↑ "Ted Koppel returns to anchor's chair on 'BBC World News America'". Latimesblogs.latimes.com. Retrieved 2017-01-18. ↑ "America's Chronic Overreaction to Terrorism". Wall Street Journal. WSJ. Retrieved 24 March 2015. ↑ Chris Ariens (2016-03-13). "Ted Koppel Named Special Contributor to CBS Sunday Morning | TVNewser". Adweek.com. Retrieved 2017-01-18. 1 2 Gough, Paul J. (November 28, 2008). "Ted Koppel, Discovery parting ways". Reuters . ↑ Genzlinger, Neil (July 9, 2008). "On the Trail of Consumerism in a Booming Chinese City". The New York Times . ↑ "Paul White Award". Radio Television Digital News Association . Retrieved 2014-05-27. ↑ "Honorary Degrees - Past Recipients". University of Southern California. Archived from the original on November 29, 2008. Retrieved January 2, 2011. ↑ "Ted Koppel : Awards". IMDb.com. Retrieved 2017-01-18. ↑ "Joel Rosenberg on The Passion of the Christ on National Review Online". 26 December 2010. Archived from the original on 26 December 2010. ↑ "Ted Koppel's son, 40, found dead in NYC apartment". USA Today . June 1, 2010. Archived from the original on 31 October 2010. ↑ Columbia Journalism Review, March/April 1989. 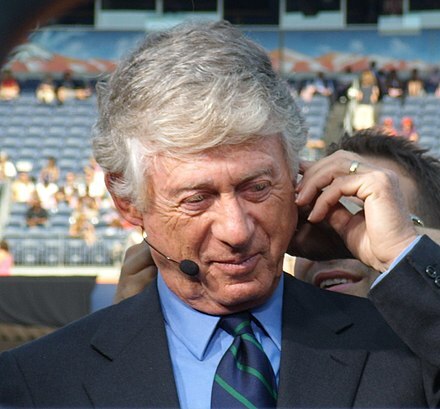 Wikimedia Commons has media related to Ted Koppel .